built-in input devices, the laptop is almost always inferior to its desktop counterpart with high-performance hardware. The difference in cost between them helps to finally determine the choice. Of course, not in favor of the laptop. New gaming laptop MSI with a long name MSI GT80 2QE Titan SLI can change the situation. Manufacturer modestly silent about it, but this model looks like it could turn out to be not just one of the most powerful mobile gaming machines, and just the most productive. In GT80 2QE Titan SLI one of the most high performance modern mobile processors is adjacent to a pair of powerful video cards NVIDIA GeForce GTX 980M, SLI, and with a full-size SteelSeries keyboard with full mechanical switches Cherry MX — like desktop gaming keyboards. The manufacturer proudly States that this is the first laptop with a mechanical keyboard with backlight. set of printed products, including manual work. For accessories, we’ll be back a little later, so for now only note that the package is really pleasing to the eye, but the question of why in the box with one of the most expensive gaming notebooks in the world don’t have basic cover remains open. It’s still a mobile PC, and MSI just did is famous for, and not to deprive the majority of their game models the standard case. In the case of the GT80 2QE Titan it would be especially important, as to find a suitable bag for such a huge device is difficult. 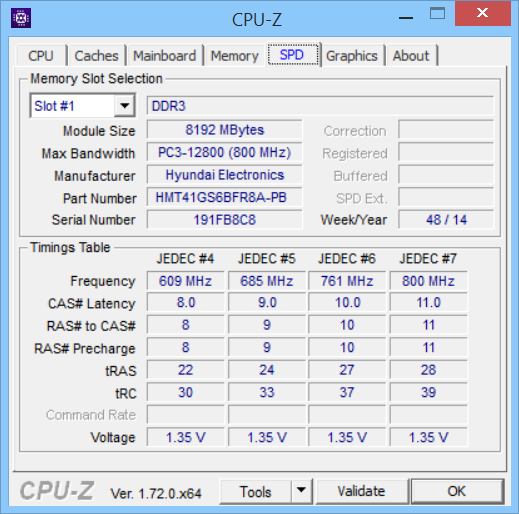 The laptop comes in several versions with different processor and amount of RAM and disk subsystem. Us on the test got the version in the maximum configuration: it is based on Quad-Core Intel Core i7-4980HQ, built on the architecture Haswell. It has 6 MB of cache memory and operates at a base clock frequency of 2.8 GHz, increasing to 4 GHz with one active core or up to 3.8 GHz with four active cores in Turbo Boost mode. This processor appeared only in the third quarter of last year, so laptops based on it are just beginning to sell. 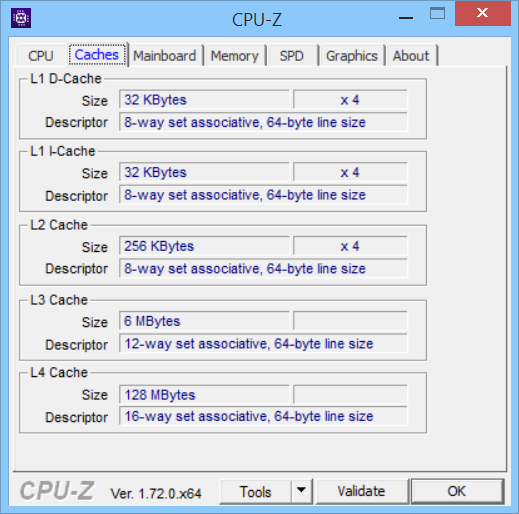 It would be perverse to call it the most efficient for today’s mobile processor, still produces models Extreme series. 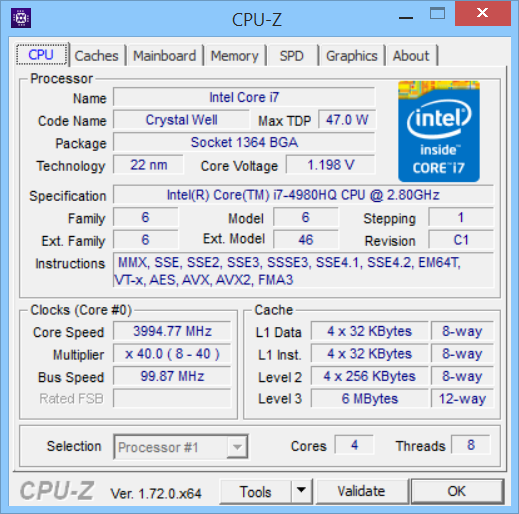 For example, there is the Intel Core i7-4940MX with advanced features of overclocking, but TDP had almost 20% more than the model Intel Core i7-4980HQ, and is 57 watts to 47 watts, respectively. For high-performance laptop such significant difference significantly complicates the already complex cooling system. The choice of CPU is more than justified, because in its capabilities it is comparable to high-performance desktop solutions. 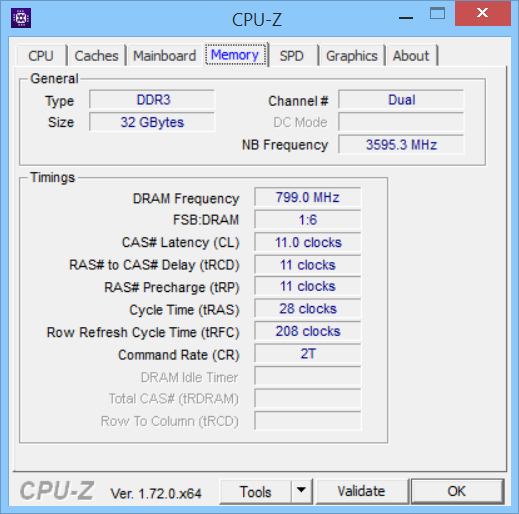 Intel Core i7-4980HQ works with DDR3L-1600 memory with maximum capacity of 32 GB. In this modification of the notebook MSI GT80 2QE Titan SLI these capabilities are used 100 percent. 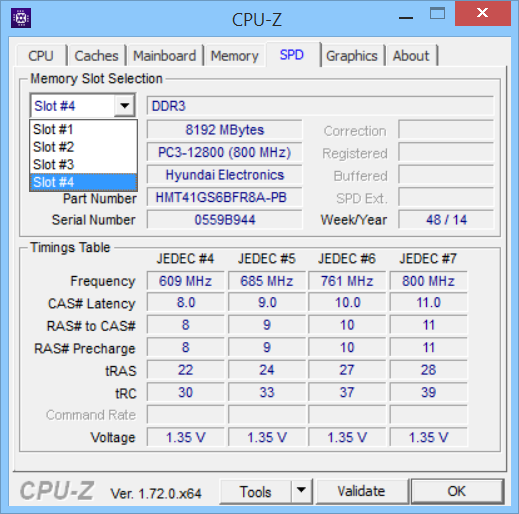 All available on the motherboard four SO-DIMM slots are occupied modules DDR3-1600 HMT41GS6BFR8A-PB production of South Korean company Hynix Semiconductor with a volume of 8 GB each. 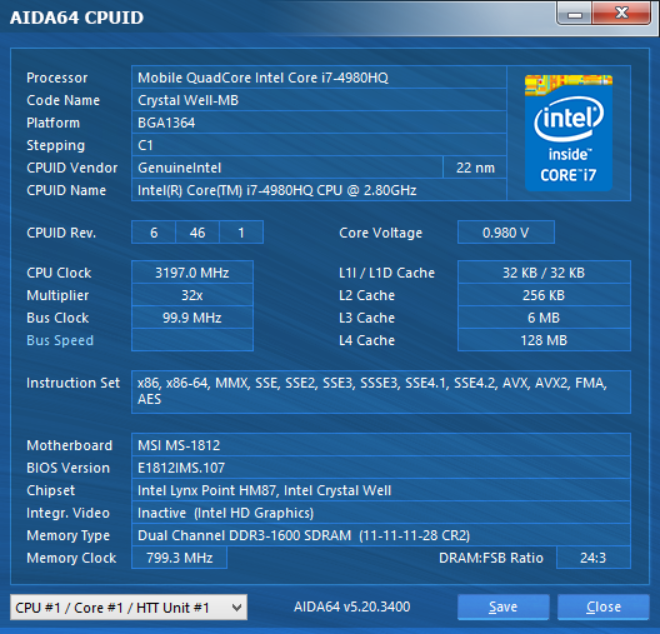 The heart of any gaming laptop is the video card — in this case it is necessary to classify key features of the product. Typically, this hardware component is a weak link in a mobile gaming PC, not allowing to compare it fully with Board decisions. But MSI GT80 2QE Titan SLI will give odds to their desktop brothers: it has two of the most powerful mobile video card NVIDIA GeForce GTX 980M combined by SLI. These discrete cards based on chip GM204 architecture Maxwell, and operate at a frequency 1038 MHz. 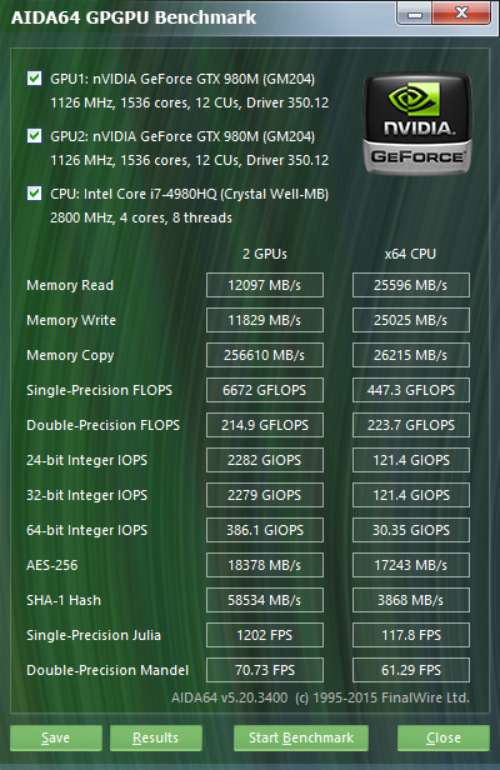 Each card has 8 GB of GDDR5 memory with a frequency of 1253 MHz (effective frequency of 5 GHz). In the laptop has three outputs: one HDMI version 1.4 and a couple of interfaces Mini DisplayPort version 1.2, which can be simultaneously connected to three monitors with resolutions up to 3840 × 2160 pixels. MSI GT80 2QE Titan SLI can run with the built in processor graphics Intel Iris Pro Graphics 5200. This is one of the most productive today embedded solutions based on the core GT3e and characterized by the presence of internal memory Embedded DRAM (eDRAM) with capacity of 128 MB. 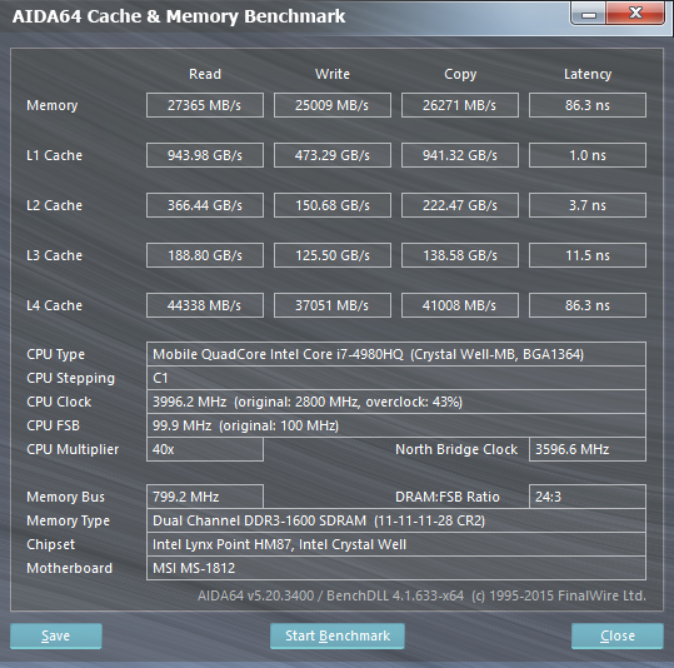 The eDRAM memory can be used to store data not only on the core GPU, but the CPU cores, which have a positive impact on processor performance. In the case of MSI GT80 2QE Titan SLI is the only thing that really is important to know about integrated graphics is the fact that the laptop is able to switch to it — that is, can work on batteries as though something tangible. 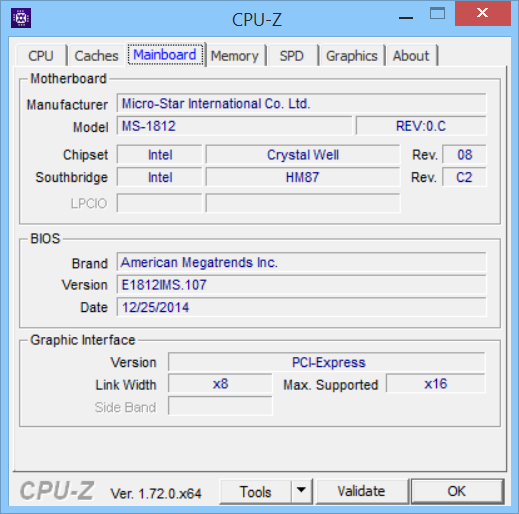 Not all gaming laptop manufacturers leave the processor graphics is active. The GPU button allows you to manually switch from one video to another — in that case, if automatic switching for some reason did not work (and this happens on many laptops). The second key feature of MSI GT80 2QE Titan SLI (after two graphics cards in SLI mode) is his high-performance disk subsystem. Or rather, two of its component parts. The first is unremarkable — this 2.5-inch hard drive HGST Travelstar 7K1000 (HTS721010A9E630) production units of Hitachi. It is possible to model the capacity of 1 TB, the buffer memory of 32 MB and works with the interface eSATA 6 GB/s and a spindle speed of 7200 rpm, This drive is split into two logical partitions, most of which is empty, but 12,89 GB given over to the recovery partition. 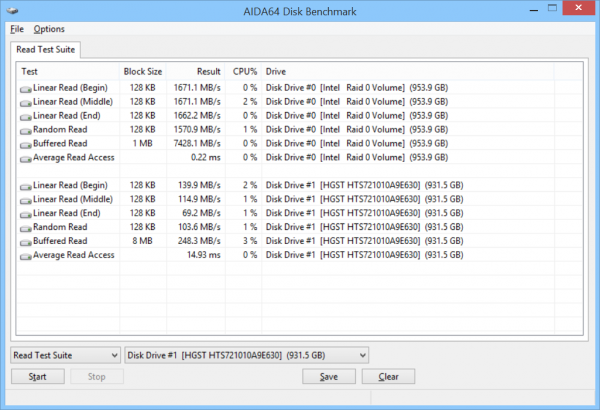 The reading speed test in AIDA64: top value HDD HGST Travelstar 7K1000, the lower one for the RAID 0 of four SSDS Toshiba THNSNJ256G8NU. If the hard disk is supposed to store various data, system files and installed games created your virtual disk based on the RAID array assembled on four SSDs format M. 2, which applied modules Toshiba THNSNJ256G8NU capacity of 256 GB each. The array has its name, MSI Super RAID 3, but in fact is a normal RAID 0. For the user this means an unmatched speed of data – about 1600 MB/s for reading and about 1300 MB/s when writing. 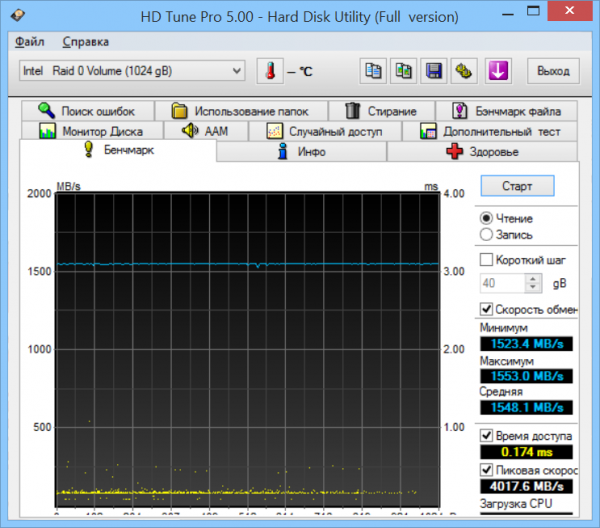 Even among owners of high-performance desktop gaming computers there are few lucky people who can boast of such values, the performance of the disk subsystems. To understand the performance level of this RAID array, it is sufficient to say that the OS on this laptop boots up in around four or five seconds. The laptop comes with an optical Blu-Ray drive Hitachi-LG HL-DT-ST BD-RE BU20N and reader for flash cards format SD (XC/HC). Sound respond unremarkable module Realtek ALC892 and a rather interesting system with two pairs of stereo speakers and a subwoofer from manufacturer of Hi-Fi acoustics, the company Dynaudio, which is MSI, which has worked here for five years. In addition, the laptop has three independent audio amplifier for four speakers, subwoofer, and line audio output. To the last you can connect headphones with an impedance of 48 Ohms. 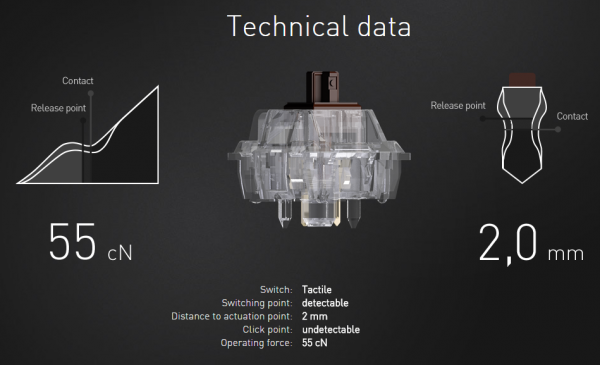 In addition to the analog audio output, MSI GT80 2QE Titan SLI there is also a digital optical output S/P-DIF, and a connector to connect the microphone. Network interfaces represented by Gigabit Ethernet controller and the module Wi-Fi 802.11 b/g/n. Also on the motherboard installed PCI-E controller Killer e2200, providing integration of wired and wireless interfaces technology Killer DoubleShot Pro, which can significantly increase the overall throughput of the network. The survey is a set of USB ports of the five pieces, all of which have specification 3.0. Rechargeable battery built into the case. Its capacity is 75 WH (5225 mAh, 14.4 V). To charge the battery and to operate the laptop from the mains with a power adapter really impressive weight and dimensions: 200 × 100 × 43 mm, 1.3 kg. the Adapter has at least an impressive output power — 330 watts (of 16.9 And 19.5 In), comparable to the power supplies of desktop PCs. The developers of MSI GT80 2QE Titan SLI has managed to pack the entire high-performance hardware, including the rather big dimensions of the cooling system, in a relatively slim body. It is still a place for design refinements, of which the novelty is enough. Traditionally, for a serious gaming laptop, this model is made in typical brutal style. Body with all its ribs and the ventilation grilles of the cooling suggests not something about a sports car, not a spacecraft. In short, once the user configures the gaming mood. The main elements of the case is made of dark gray plastic, and only the upper part of the cap, and inner panel above the keyboard made of metal, also painted in dark gray color. In this case, the cover flaunts signature red logo with a white glow when the dragon is the defining characteristic of the game series MSI notebooks. The back cover fits on one large loop, slightly offset from the rear side faces to the center. No locks are not provided, but it fits to the body very tightly, with minimal (given the scale of the device) clearance. The laptop was easier than it looks. When you take it in hand, tense and prepared to make a great effort, which in fact is unnecessary, as the mass of the device is much less expected. Their misleading role in this play and the very numerous ribs strengthen Yes ventilation grill highly developed cooling system, giving this model of solidity. The latter is located laterally, behind and in the lower part of the body. The building at the MSI GT80 2QE Titan SLI has traditionally tapered to the front edge shape for more convenient operation with the keyboard, but despite this, the distance from the surface of the table on which is a laptop while working, to the top edge of the front edge of the open is large enough. In its formation participated still quite high triangular legs placed around the perimeter of the bottom surface of the housing. Lining under the wrist of the package is just designed to compensate for this difference and provide comfort when working. The front panel of the laptop carries three led indicators that inform the user of the wireless adapter, the diet and activity of the storage system. On the left side of the face closer to the user, all audio jacks, three USB 3.0 ports, card reader for flash-cards and a slot for attaching a security lock such as the Kensington, and directly under the lid of the laptop has a built optical drive. The right side is almost empty — there is only a couple USB 3.0 ports. Well, at the rear edge of the laptop located those interfaces that do not require frequent reference to connect and disconnect different devices. We are talking about three video outputs, network RJ-45 connector and modular four-pin plug to connect power adapter. 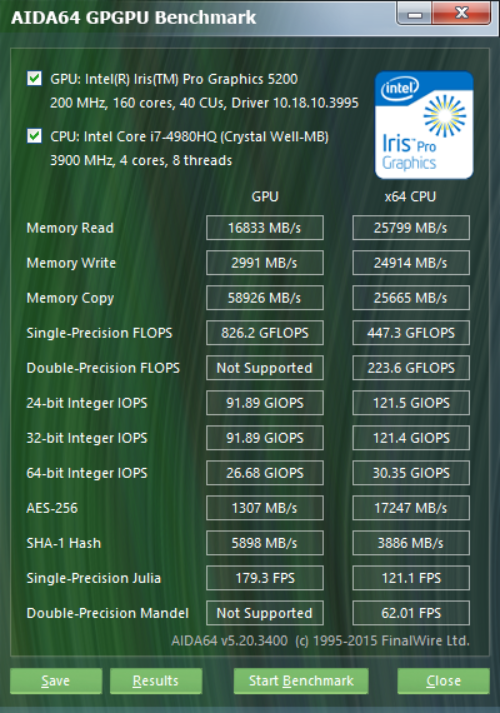 In the disclosed form of the MSI GT80 2QE Titan SLI n e less interesting. Cover this model is quite widely, but not completely, and at the angle of about 135 degrees, which is more than enough for comfortable work at the table, and laptop on his knees. The course cap is tight, and she bends slightly, if to take it not in the center and the edge. The display has a fairly wide frame around the perimeter, and above him is a webcam with a pair of microphones. This is all conventional in design, the MSI GT80 2QE Titan SLI ends. Unusual for any laptop mechanical keyboard SteelSeries, this model is also very unusually located – not in the center and closer to the hinges of the lid, like other mobile PCs, and the maximum shifted to the left and to the user. This is done in order to ensure the greatest comfort at work, because the body of the laptop is quite high and even with a pad under the wrist to reach the keys located at a great distance from the edge, not very convenient. Steel keyboard arrangement minimizes this problem. The downside with this arrangement is the unusual placement of the touch panel, which MSI GT80 2QE Titan SLI along with buttons that emulate basic mouse button is moved from the Central space under the keyboard to the side. As a result, to use a touchpad on this laptop is not so convenient as the same input device other models. However, upset is unlikely, because the touchpad for a gaming laptop is just an additional input device. Without a mouse to use this PC still will not work. But the touchpad from the MSI GT80 2QE Titan SLI is not simple. Another original solution designers MSI is that clicking on one (touch key) instantly transforms the panel into a digital unit additional to the main keyboard. Above the keyboard and touchpad stretches the huge, almost empty metal space just barely visible perforations that hides the built-in speakers, and a small triangular block of additional keys. The biggest key in this block controls the power, the middle switches between the operation modes with integrated or discrete graphics adapter, but clicking on the little key, can, in the truest sense of the word, to make a lot of noise – is forced to activate the operation of the cooling system at maximum speed. For dessert, we left the description of SteelSeries keyboard, as one of the main features of this model. 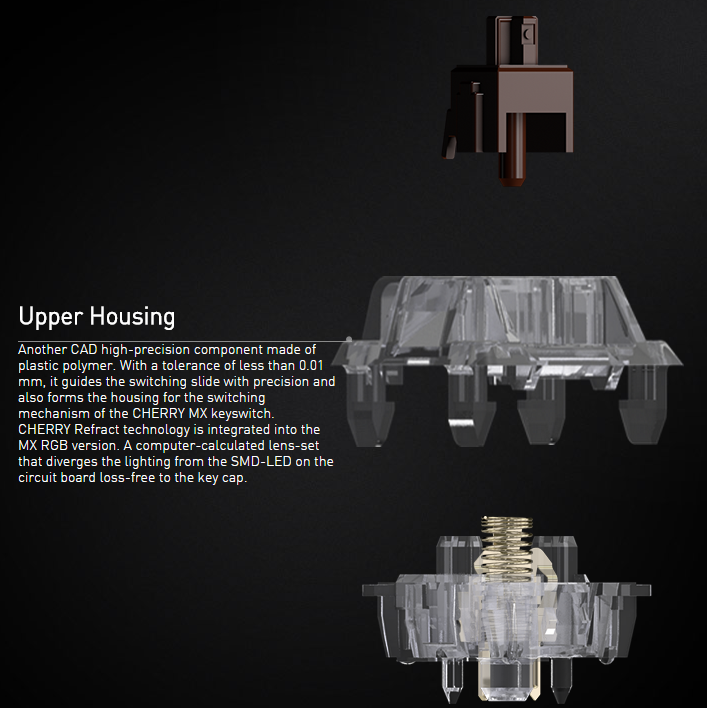 It has plastic keys with conventional desktop counterparts for high profile, revealing the mechanical Cherry MX switches like Brown. “Brown” series is known to any gamer keys is different from a purely gaming series Black and Red that represents a compromise between the usual keys for typing and a gaming. These keys do not have a distinctive click when pressed and are of fairly long stroke. Despite the universality of “passport” to print texts on a keyboard. But to play using any of the available keys from the comfort of desktop keyboard. The only drawback is the height at which the keyboard is located. But, first, the manufacturer has tried as much as possible — as it is possible to omit the substrate with a keyboard inside the case, thus reducing the height of the upper edge of the key by a few millimeters. But secondly, as mentioned earlier, in the package with the MSI GT80 2QE Titan SLI is the special pad under the wrist, compensating this deficiency. The pillow is dense enough, but sags under the weight of the hands. Inside, apparently, it is the gel filler, and the outside covered with durable woven material, pleasant to the touch. Sliding around the table counteracts the base, made of silicone or some soft plastic. The keyboard layout is not mobile, such as desktop models, with the only difference that key [Win] moved from the left side to the right. This is done in favor of the needs of players who are using standard for most games keys [W], [A], [S] and [D], do not risk to accidentally exit the game, hitting [Win] palm or wrist. However, this button can be disabled and programmatically through the included. All keys have keyboard plastic, but, as indicated above, the game four and joined them press [Esc] to replace the metal supplied. Extra replacement keys are supplied in a metal box along with a plastic key for installation and dismantling. Keys is hardly more convenient than conventional plastic, but the appearance of the laptop they are doing even more striking. Exclusively subjective feeling, instead of Golden color keys, in this case a much more harmonious would look red, combined with inserts body. However, the rate is, as they say, is not affected. The whole unit with a keyboard and a touch panel has an adjustable backlight red. Control is performed by hardware, cursor keys with pre-pressed function key [Fn]. The lighting has three brightness levels and can also be disabled completely. Any way to improve the already highest possible specifications MSI GT80 2QE Titan SLI is extremely difficult. Except to replace the hard drive higher capacity if the need arises. However, access to the main removable components of the laptop is easier than in other models. You only need to Unscrew the two screws in the bottom case, then open the lid and slide the metal panel above the keyboard to the right. This access will open two of the four slots with memory modules, hard drive, SSD modules, and — along with all these removable components of the four fixed dynamics. After removing the bottom plastic panel of the case, the user gets access only to the remaining two slots of RAM. All other non-removable components accessible from below. However, if you ever need to clean the cooling system, you have to climb here. In General, it should be noted that assembled the laptop very tightly. Despite the large dimensions, space inside is not at all. Well, about the build not the slightest criticism — nothing to loose, not loose and does not creak.